I've been looking for opportunities to practice my stand up paddle surfing skills. Inspiration caused me to consider the Gorge waterway as a potential source of wave action. Most of the time, the water along this river-like sliver of ocean is calm and inviting. 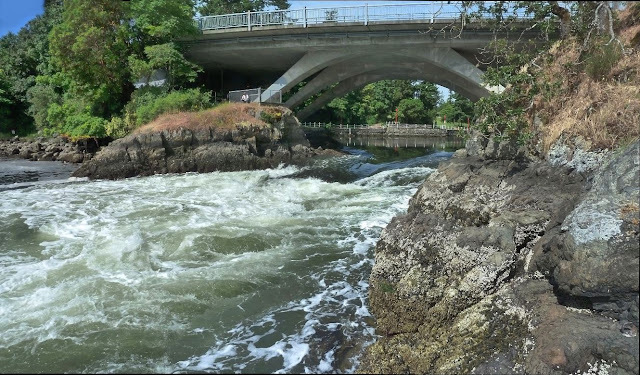 However, under the local Gorge-Tillicum bridge, the waterway narrows and can produce whitewater rapids as the water flows out of upper Portage Inlet at low low tide. I went to check them out and was disappointed to see that they are completely unsuitable for practicing any sort of paddle board sport. The water is turbulent, full of eddies and whirlpools that don't mimic ocean waves in any way. Even the most experienced paddler would likely find themselves getting tossed into the churning, heaving water and facing a watery death.